Glutathione S-transferase (GST) is a family of enzymes that plays an important role in the detoxification of xenobiotics by formation of glutathione adducts via the thiol group. GST utilizes glutathione to scavenge potentially toxic compounds including those produced as a result of oxidative stress, and is an important part of the defense mechanism against the mutagenic, carcinogenic and toxic effects of such compounds. The GST Fluorometric Activity Assay Kit provides a simple, fluorescence-based in vitro assay for detecting GST activity using a fluorescence plate reader. The assay utilizes monochlorobimane (MCB), a dye that reacts directly with glutathione. The free form of MCB is almost non-fluorescent, whereas the dye fluoresces blue (Ex/Em = 380/461 nm) after reaction with glutathione catalyzed by GST. The change in fluorescence over time is thus allows for an easy direct measurement of the sample GST level. 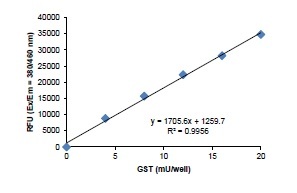 The kit can detect GST activity in crude cell lysate or purified protein fraction. The kit can also be used to detect or quantitate GST-tagged fusion recombinant protein. Detection sensitivity < 0.5 mU. This assay provides for the detection of Glutathione S-transferase (GST) levels in various biological sample types. Glutathione S-transferase (GST) Activity Assay Kit standard curve.